Jack Dempsey once said that "no man has everything." On that matter, there is no doubt, and it applies to every fighter who has yet lived, with the possible exception of "Sugar" Ray Robinson. This article is not concerned with Jack Dempsey the myth or the legend, but rather what can be seen about Dempsey the fighter through close observation of the available films of his fights. Dempsey was as tough as any heavyweight seen before his pro-debut, or as anyone who has come along since his retirement. Jack had a proven chin, and demonstrated his psyche couldn't be shaken, evidenced by him getting off the canvas twice to knock out the hard-hitting Luis Firpo. Certainly Dempsey's record cannot be ignored. His 25 first round knockouts are tops amongst all the heavyweight champions. He went through the division on his way to the heavyweight title, destroying top contenders such as Carl Morris, Fred Fulton, Battling Levinsky, Gunboat Smith, K.O. Bill Brennan, Billy Miske and of course champion Jess Willard. There has been talk by some critics that Dempsey ducked or avoided black fighters. Let's set the record straight. There was really only one black heavyweight worthy of a title shot during Dempsey's championship years, and that was Harry Wills. Dempsey did not duck Wills. Nor do I believe he feared losing to him, hence he did agree to fight the black contender. It was promoter Tex Rickard, who promoted the Jack Johnson – Jim Jeffries fiasco who wouldn't make the fight. It was too soon after Johnson, who was perceived as a threat to white America with his loud mouth and the supposed flaunting of his white women that challenged the white man's sexuality. Dempsey was more than willing to fight Wills. Again, it was the white promoters who controlled the sport that would not let Dempsey meet him. In evaluating Dempsey the boxer I am not interested in second and third hand opinions. Nor am I interested in first hand accounts of those who might be inclined to favor Dempsey as the icon of their era. What is relevant to Dempsey the fighter is what is revealed about him via closely observing the available films of his boxing career. All things highlighted in this article are based solely on observations made watching the available footage of Jack Dempsey. Perhaps it is not fair to say with impunity how great he may or may not have been, based on a mere seven fights of a career that spanned 83 pro-bouts, but there is enough footage to draw some conclusions based on the available films. The thing that Dempsey should be most credited with, but seldom is, is the fact that he was the first sophisticated pressure fighter. Since Dempsey, there have been three great heavyweight swarmers, Rocky Marciano, Joe Frazier, and Mike Tyson. Yes, all four pushed the fight, however they weren't the same as to the manner in which they utilized their aggression. Dempsey's fighting mindset was to apply pressure trying to force his opponent into making mistakes in order to create openings, as he was trying to get inside to land his two-handed assault to the head and body. He was extraordinarily refined in his side-to-side movement, bobbing and weaving while his upper-body was in constant motion: he moved forward better than any fighter who came before him fighting as the attacker. The swarmers who'd come before Dempsey, like "Sailor" Tom Sharkey, Marvin Hart, and Tommy Burns, were much more crude in their pursuit. Sharkey and Hart were more upward and stationary, and Burns never used leverage, and tried to push his opponent back, most resembling a lineman battling for position on the line of scrimmage. If an opponent came to fight him, Dempsey was practically unbeatable. For his time, he really was the baddest man around. Jack was an exceptional two-handed puncher. His left-hook had one punch knockout power, and his right hand was straight and powerful, usually thrown with his full weight behind it. He had fast hands, and was at his brilliant best fighting as the aggressor. But it must also be said that Dempsey wasn't always on the attack, and would routinely step back to draw an elusive opponent to him, looking to counter-- a tactic he implemented due to his ineffectiveness at cornering a mover, or when he was unable to impose himself on the opponent, physically. If the opponent was an experienced mover/boxer, Dempsey wasn't a life-taker. Lotierzo reached his conclusions based on studying available film, not relying on ancient or third hand assessments. Its funny how sometimes a fighter will be plaster-sainted by historians and fans so much that the thing he might actually deserve the most credit for, is often overlooked or missed. When Dempsey is mentioned as being a puncher, then it's said you're ignoring his skill as a boxer, and his capacity to adjust his style. Then you hear it said, how about his short range and concise punching ability? For the record, Dempsey wasn't a boxer/counter-puncher; he was an attacker, who sometimes stepped back as he looked to set the opponent up for a knockout blow. Based on the available fight footage, most of his finishing punches thrown are looped. Sure, he threw some nice straight short shots versus Luis Firpo, and knocked out Jack Sharkey with a short left-hook. However, that doesn't identify him or his style. If that's the case, based on Joe Frazier's rematch with Jerry Quarry, you'd think Joe had a good left-jab. The same can be said if you'd only seen a few films of Muhammad Ali. Suppose his fight against Oscar Bonavena was one of only a few that you saw of his career; you'd come away thinking Ali had a great left-hook. When the reality is, Frazier's jab wasn't much of a weapon, nor was Ali's left-hook a reliable finishing punch. In spite of Dempsey being the first true great attacker/swarmer, he's not the most effective heavyweight great in that mold. He didn't apply constant pressure, nor did he cut the ring off particularly well when he was confronted by an upper-tier boxer who used his legs and utilized steady movement as a form of defense. When the just turned 28 year-old Dempsey defended his heavyweight title against light heavyweight, Tommy Gibbons, who he outweighed by 12 pounds, Gibbons was sixteen months removed from getting worked over by Harry Greb, who Gibbons out-weighed by 7 pounds. Greb wasn't bothered by Gibbons’ movement and landed with regularity. The same cannot be said for Dempsey. Gibbons’ movement and sudden stopping to throw quick one-twos disrupted Dempsey's attack. While Gibbons was on the move, often during the fight Dempsey was forced to reach and lunge. Because of his inability to cut off the ring and take away Gibbon's space and force him to have to fight and trade, Dempsey would move back and attempt to get Gibbons to go to him, hoping to land his counter attack. The simple truth is Dempsey was nothing close to superb at cutting off the ring during the bout with Gibbons. And because of that, Dempsey didn't force Gibbons to have to run or fight for his life. The extra time enabled Gibbons to time Jack on the way in, so he could tie up his hands. Dempsey won the fight clearly, but I do not see Gibbons having the same success against a pressure fighter who could cut the ring and force him to fight. Unlike Dempsey, Joe Frazier was nearly impossible to tie up. And you can't say that is what Muhammad Ali did to Frazier during their second fight. What Ali did was wrap his left hand around Joe's head and pull it into his chest. Luckily for Ali that he could take a terrific shot to the body, because Joe beat on it with both hands as Muhammad pulled him in. Most say Gibbons fought to survive, which is ridiculous. What was he supposed to do, stand right in front of Dempsey and try to beat him by trading with him? The reality is that Dempsey being the bigger, stronger man and better puncher, should've imposed himself physically on Gibbons and forced him to fight for his life, or at the least have to fight him off. Had Dempsey been able to apply non-stop pressure and been able to corner or get Gibbons against the ropes, he probably would've stopped him. Had Joe Frazier circa 1969-71 been in the ring with Gibbons, he would've had him struggling to keep him off by the middle of the second round. Joe's unrelenting attack, while slipping his jab as he cut off the ring and got closer, would've reduced Gibbons to a walk and left him a sitting duck for Frazier's body and head attack. Gibbons would not go 15 rounds against Joe Frazier. The lesson from the Gene Tunney fights is not that Dempsey was older at 31 and 32, inactive or suffering from rust, all of which no doubt is true, and it was Dempsey's third fight in a year, it's the fact that he was inept as to how to cut the ring off on Tunney in either fight. When I walk my dog and dangle a biscuit in front of him, I can make him go anywhere I want to. This is what Tunney does with Dempsey in both fights. Dempsey merely follows Tunney around the ring and never steps to cut him off. Not in two fights. Tunney beat Dempsey virtually 19 rounds to 1 for the simple fact of Jack just following him around the ring, allowing Gene to box and pick his spots, without having to fight with a sense of urgency. In an analogous manner, Muhammad Ali was 34, out of shape and past his prime when he defended his title versus Jimmy Young. Granted, a fat Ali had a lot to do with his ineffectiveness. But the lesson learned from that fight is, Muhammad Ali wasn't at his best fighting as the aggressor. Ali was a head hunter, but Young's head wasn't there. Ali's lack of going to the body forced him to lunge with quick one-twos, which usually arrived late and left him open for Young's counters. Sure, prime Ali has more success versus Young, but it's not night and day different. The bottom line is, Ali still wouldn't have solved Young's style, and he's somewhat of a fish out of water when he has to fight as the aggressor for the entire bout. Against Tunney, Dempsey was troubled when dealing with a clever boxing stylist. 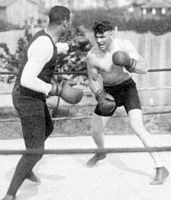 Dempsey was unable to cut the ring or apply the type of consistent pressure needed to force Tunney to rush his punches and to keep him from getting set. It is exactly these types of tactics that allowed Harry Greb, who was much smaller than Dempsey and lacked his big punch to defeat Tunney in their first fight and give him several other close fights. Instead Dempsey followed Tunney around in a line instead of blocking him, applying pressure and taking away his space. The problem with Dempsey in this fight is not his lack of conditioning or his age, it was his lack of knowledge in how to deal with a cerebral boxer who used the ring. Normally I do not believe in using sparring sessions as an analysis of how a fighter does in the ring, but since Dempsey’s filmed sparring sessions with Big Bill Tate is used by Dempsey supporters as an example of his ability to bob and weave, let’s break this down. When viewing this film what I see is Dempsey moving his head well, slipping outside making his opponent miss but not making him pay. Nor does he close the distance effectively. This brings up another stylistic point. Dempsey was simply not Dempsey if he was not bringing the fight to you. He was a swarming style aggressive attacking fighter. If he was not coming to you, then he was not Jack Dempsey. That one minute circling against Willard did not make him a boxing stylist. He was not going to outbox Muhammad Ali or Larry Holmes. He was not a guy who is going to outbox boxers like Ray Robinson could. He needed to come in and then try to take your head off. He had speed and two handed power to accomplish this as well as a reliable chin. But the argument that he can move and box until he wants to move in against a bigger, stronger and likely more powerful opponent like George Foreman is misguided. That is not how he fought the bigger Firpo who came after him. Firpo was a green one handed puncher who cannot be mentioned in the same breath as Foreman, and Dempsey was forced to slug it out with him. The Foreman of 73-74 was a 3-1 favorite over Muhammad Ali. Jess Willard, Georges Carpentier, Tommy Gibbons, Luis Firpo, Bill Brennan, Billy Miske never saw the day they would be favored over Muhammad Ali at any time of Ali's carrier between 1964-1974. None of them would have a hope to beat Joe Frazier or George Foreman. This brings us to a final point and that is Dempsey’s level of competition. Who did Dempsey beat that Joe Louis, Rocky Marciano, Sonny Liston, Joe Frazier or George Foreman would not beat? That argument may work in reverse as well in some cases. The point here is Dempsey’s level of competition was no better than other all time greats, and in more instances not as good as those who followed him. Some boxing historians seem to view Dempsey as throwing shorter punches and better combinations than Joe Louis, and hitting harder than George Foreman. If that comparison were true then Dempsey may be the greatest fighter of all time after Ray Robinson. The problem is this simply is not true. Nowhere in the available films does Dempsey throw shorter punches or demonstrate the varied and accurate punching of Joe Louis. Don't tell me one has to freeze frame the films in order to see these short punches of Dempsey. I don't need to freeze frame Joe Louis films to see his short punches. All one has to do is pick out any knockdown/knockout he scores; the short right hand that sent the giant Buddy Baer spinning 360 degrees to the canvas; the short hook that drops Galento; the combination of short punches that knock out Billy Conn, or the right hand that nearly decapitates Max Schmeling. Could Dempsey throw short punches? Sure, he has that nice short hook against Sharkey, but overall he is not in the class of Louis, who could not get wild or sloppy even if he tried because all of his punches are so short and precise. This is evident for all to see on the available films. One saying that Dempsey threw shorter and more precise punches than Joe Louis is asinine. It’s like saying Earnie Shavers had better footwork than Jersey Joe Walcott. Does Dempsey hit harder than George Foreman? Based on what evidence? Foreman lifted Joe Frazier off his feet with an uppercut. Could Dempsey do that? More importantly did he ever do anything like that? One can mythologize about a fighter all day, but what did he actually do in the ring? I have not seen the film of Dempsey lifting a man who weighs over 200 pounds off his feet and then bouncing him like a basketball off the canvas. Dempsey did not hit harder than Foreman, and it's doubtful he hit as hard. Why is it that no one ever mentions that Jess Willard was 37 years old and had not fought in three years when Dempsey clobbered him? And just because Dempsey doesn't come right out and go for the kill versus Willard, that doesn't equate to him being thought of as a fighter who didn't have to push the fight to be effective. He sure gets a lot of mileage for the one minute he circled against Willard before moving in. No doubt that this is a good tactic against a much larger opponent. However, that does not mean the same tactic would work against a fighter who is hell bent on taking the fight to a smaller man. It would not work against George Foreman. George would not stand there waiting for Dempsey to move in. He would force Dempsey to fight. Dempsey would be forced to slug it out with Foreman just as he was against Luis Firpo. If not for the sportswriters in press row pushing him back into the ring Dempsey would have lost that fight. Dempsey understood that every fighter is a man who has weaknesses; as he said, “no man has everything.” However, some observers have elevated Dempsey to the status of being more than human. Various writers have called Jack, “a superhuman wildman”, or said “there were times when he didn’t seem at all human.” One writer even stated, "Dark-bearded, mahogany-skinned, busted nose, hair cropped close and high above his ears, Dempsey “came to fight." Wow, even his haircut made him great. Never mind the fact that such hyperbole has nothing to do with how Dempsey looks on film or how his haircut made him a better boxer. Jack Dempsey did not wear a red cape, he was not made of “steel”, and bullets did not bounce off him. He breathed air, was made of flesh and blood and died the same as all men. No one living today saw Dempsey at ringside, so like it or not, he must be judged not on myth or legend and dubious tales that cannot be proven or disproved, but on how he looks on film. Based on the observable evidence Dempsey simply does not compare to technicians like Gene Tunney and Joe Louis, nor is he as effective a swarmer as Joe Frazier at cutting the ring and fighting against a boxer/mover. The reality is all of these men were simply better boxers than Dempsey and should be ranked ahead of him. In conclusion Jack Dempsey is a fighter whose myth and legend gives him a lot of romanticized abilities that are simply not evident in his films. This article first appeared at The Sweet Science April 20, 2009.